Attacks in northeastern Congo by a Ugandan rebel group, the LRA, has displaced at least 320,000 Congolese, perhaps as many as 120,000 of them in the last month. Those displaced are mostly farmers who now have no access to their fields resulting in malnourishment and a threat of starvation. You might think, “Oh, more bad news about the Congo”, and I would understand. But the fact is that the area in question has been peaceful unlike some other parts of the Congo. So people who were able to take care of themselves and their families through subsistence farming, and who were going about their lives in peace, have been harassed and chased from their homes by a rebel group to which they have no tribal, ethnic, ideological, political or other link. 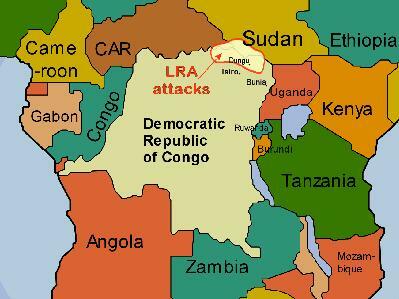 Their only “fault” was living in an area where the LRA felt they could operate because it is remote and offers good cover. This entry was posted in Congo and tagged Congo, Koni, Lord's Resistance Army, LRA. Bookmark the permalink.